Hello sports fans, Carlos here with your Windy City Sports Report. In this edition, the Bulls keep rolling; the Blackhawks try to stay undefeated. Things are getting very interesting at the Madhouse at Madison. The Bulls are making the league take notice of them. It seems like it does not matter who inserted into the lineup, Coach Tom Thibodeau is going to have them play with intensity and have them play tough defense. No Rose, no problem. No Deng, no problem. No Boozer, no problem. No Boozer, Noah, or Hinrich, no problem. Hello sports fans, Carlos here with your Windy City Sports Report. In this edition, the Bulls keep rolling; the Bears get their man; we finally have hockey. Hello sports fans, Carlos here with the first Windy City Sports Report for 2013. In this edition – who will be the Bears’ next coach? The Bulls beat WHO and lost to WHOM? Is hockey really coming back? Well, Saturday was the Wild Card round in the NFL playoffs. The Bears were prepping for…oh wait, that did not happen, did it? Nope, it did not happen. The Minnesota Vikings beat the Packers (yet another reason to hate the Packers) to grab the last spot in the NFC playoff bracket. Instead of traveling to San Francisco to face the 49ers, Lovie Smith got his traveling papers out of Chicago. Hello sports fans, Carlos here with your final Windy City Sports Report of 2012. In this edition, what happened at Halas Hall, the Bulls move steady, and can we just forget hockey? Greetings CineSportsTalk fans, allow me to introduce myself, I’m Teresa Bellomo Peterson aka The Gossip Whore. My hubby, cofounder here (I’ll let you guess which one) has been harassing the crap out of me to write a gossip column. He seems to think that just cause I have more frenimies that any woman he has ever met, and I trash talk anyone and everyone, I may be on to something here. So like it or not here I am ready to give you the low down on the low down and talk some trash about anyone I deem suitable, which pertains to pretty much everyone…. (family members not discluded) First up is my girl Bethenny. Looks as though her marriage is over, sigh. Shocker? Not so much. I actually really like Bethenny, she reminds me of myself, other than the fact that she weights 80 lbs soaking wet and is a millionaire, we have many things in common. She always blurts out what’s on her mind and she is extremely abrasive, a quality I take crap for at home and in the office. Sorry but if we were men it would be perfectly fine to be obnoxious, abrasive and painfully honest. But nope instead we should know our role! Well I applaud Bethenny for getting where she is today by being who she is. Bravo Bethenny (get the pun) Her marriage however was doomed from the start. I have watched her since RHNYC when she was single. I get that she wants to be herself. But when she chose this poor schmuck I knew he was doomed. He is way too much of a yes man. Stand up for yourself man, where are your balls?? Bethenny, I get you, I really do. But sometimes you have to play the pretty dumb girl (bats eye lashes, wink wink) Let him think he is in control. Think is the operative word here. It was painful to watch her with is family, ouch! If I have learned anything being married its play nice with the family, just smile, nod and keep your mouth shut. Remember they don’t really consider you family anyhow. They just tolerate you and don’t care about your opinion. Poor Jason had no idea what he was getting himself into. My advice to Jason, RUN and don’t forget to grab half her millions from her Skinny Girl account. Hello sports fans, Carlos here with your latest Windy City Sports Report. In this edition, are the Bears still in the playoff hunt? How well are the Bulls playing without Rose? When will they cancel the hockey season? 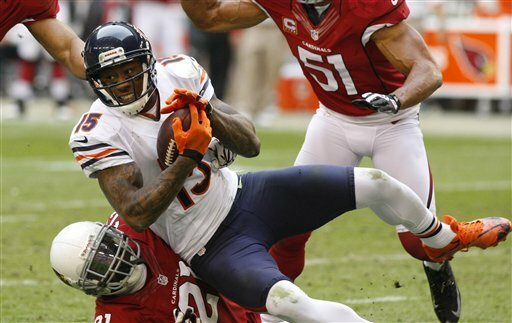 The Bears faced the Cardinals in Arizona on Sunday, fighting for their playoff lives. It showed in their play as they cruised to a 28-13 victory. Hello sports fans, Carlos here with the latest Windy City Sports Report. In this edition – can the Bears stop the bleeding? What are the Bulls doing? Will there EVER be hockey? The Bears had their final home game of the year on Sunday against their hated rivals, the Green Bay Packers. On the line was the NFC North title. A win would give the Packers the title. The Bears did not want that to happen on their home turf, but that is exactly what happened as the Packers finished the job in a 21-13 victory.